Only about 1 more month before we begin our homeschooling adventure at Rossimore Academy! I'm excited and nervous about our very first year. I am so blessed to have other homeschooling moms to help me along the way. Seriously, one only lives about a mile away in case of an emergency. : ) I have to mostly thank my Lord and Savior Jesus Christ for helping me through this whole process. He has helped to keep me from getting too scattered about it all, and by providing ideas to make the homeschool room and the now shared girls room complete. I can't tell you how many times on other projects that I've liked an idea only to dislike it later. This time I feel satisfied that the rooms are what I and the girls need to feel like we are settled in spaces that work for us and appeal to us. For the girls' room, I wanted it to look as BIG/ROOMY as possible. 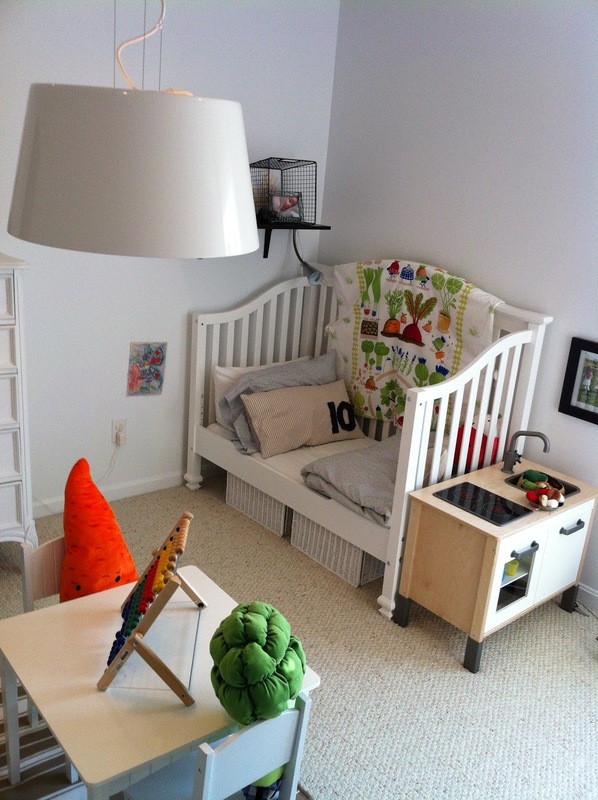 The room was originally beige/tan, then we painted it with a yellow and blue stripe. I ended up not liking that (sort of circus tentish), so when we decided to move the girls in together, I begged my hubby to let me paint again. This time I went with good ole white paint. Yep, white. 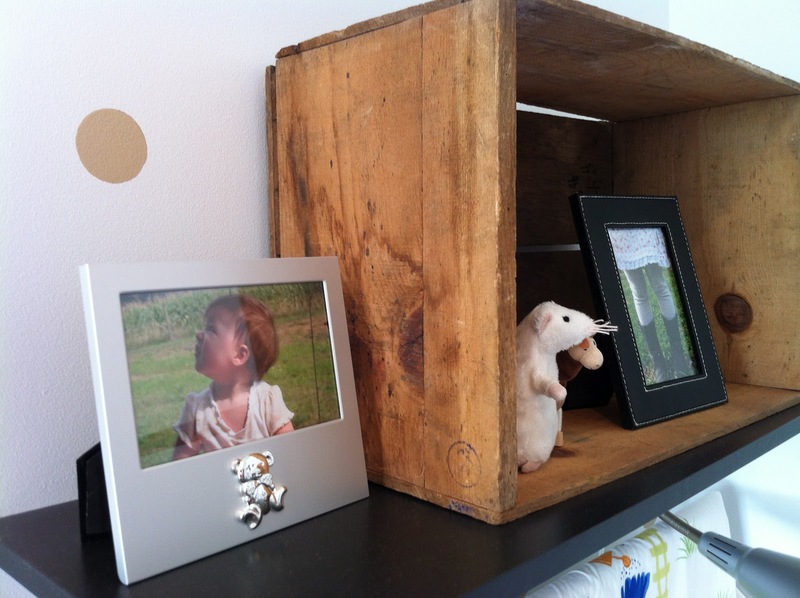 I accented one wall with a very light mocha polka dot pattern. I got the idea from one of Ikea's example rooms. I looked and looked for a beige polka dot wall paper to no avail, so we marked, stenciled and painted one polka dot after another. It was a LONG process, but I'm glad that we did it. 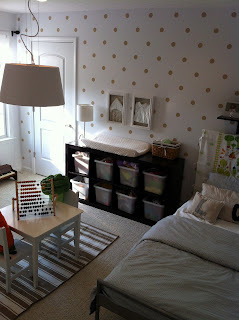 I bought a few things from Ikea to modernize the room a bit and a few things we already had. Looking from the bedroom door straight into Iggy's bed. The mocha polka dot treatment. This is a cute little frame and poem that someone gave us I think for Iggy's birth. I think it is very sweet. Here an Ikea 'flower pot' that I transferred over from my room so Iggy can use it as a 'hair station'. I put her brush and a few hair elastics in it so she can work on her own hair in the morning. Here's the piano that Mammie loaned us. It pretty old but it still plays really nice. 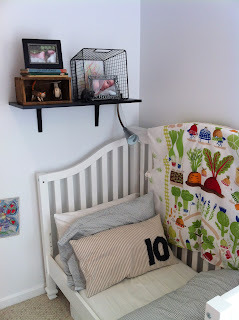 Looking from Iggy's bed to Inky's toddler bed. Some cute books I picked up at the Public Library book sale. I got the old wooden box from the Peddler's Mall for $3. 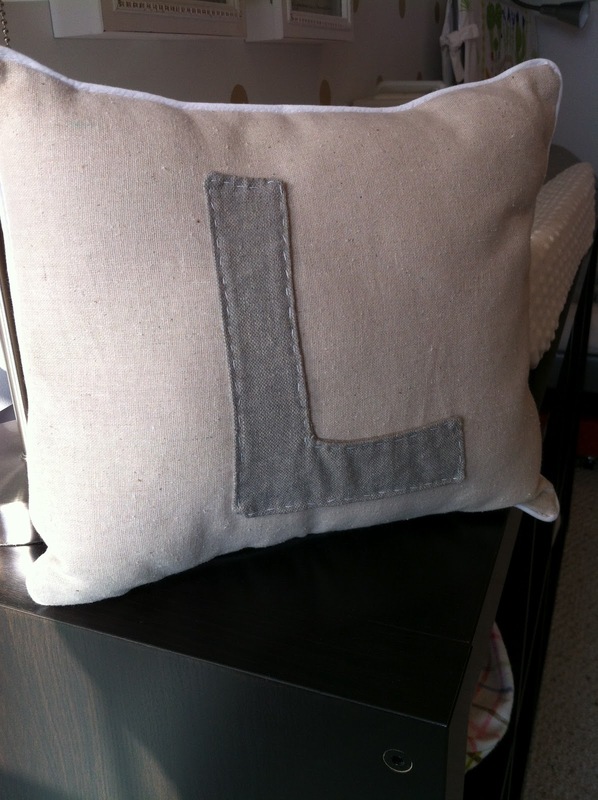 A pillow I made for each of their beds. Glad their first names both start with an L. It was an easy letter to do. I'm not sure what I would have done with an R or a B or something. This is the shelf above Iggy's bed. Her box was also from the Peddler's Mall but it was $7. Inky's Ikea kitchen that she got for her birthday. Painted the walls white (in hind sight, I wish I had painted it a soft white rather than a bright white). Painted beige circles on the wall. White simple curtains from Target (I think they were about 15.00). I took them from the room that we ended up turning into the school room. 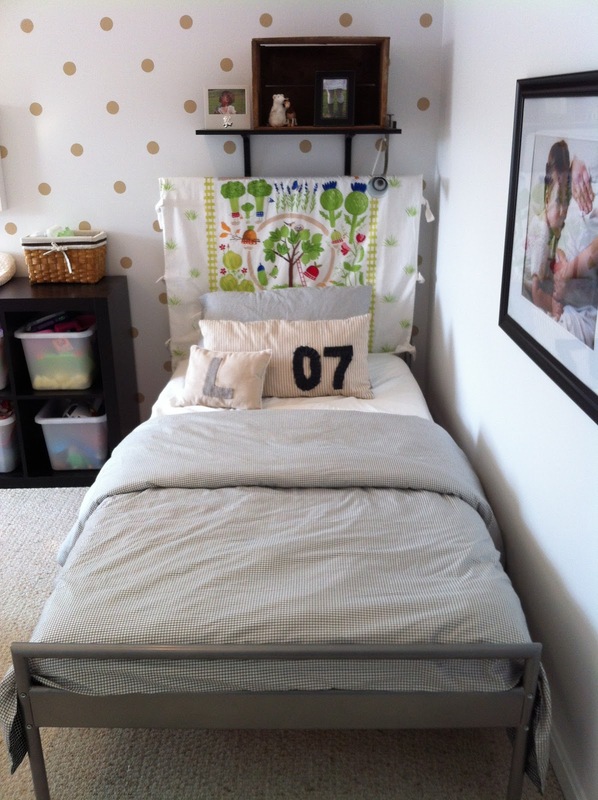 Ikea metal twin bed (69.99). Price does not include the slatts or the mattress - sigh. Headboard covers - made from some fun kids material from Ikea (7.99) and some other white material from Walmart from the bargain bin (I think about 1.50 a yard and I used about 4). Black/Brown Expedit cabinet from Ikea (69.99) - This was a big ticket item bought when my oldest was little. Glad that it's held up. 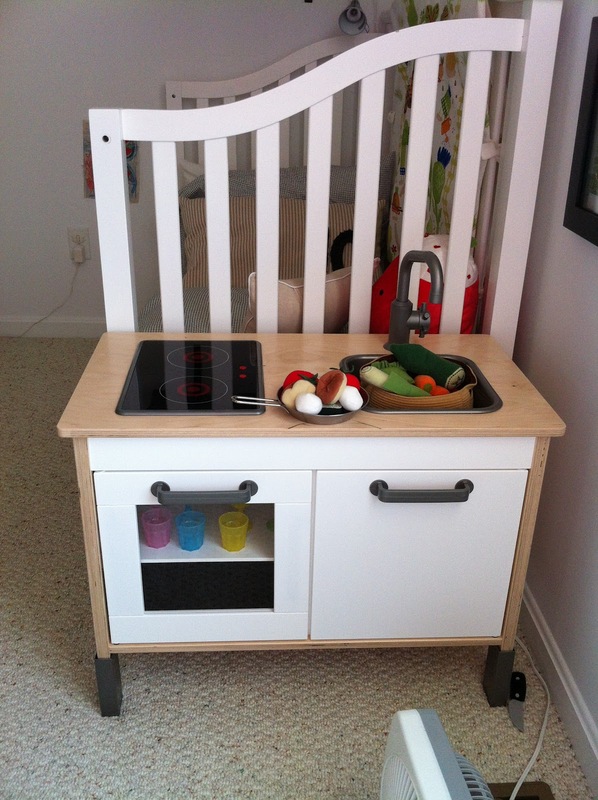 Ikea kids kitchen, bottom unit only (99.99) at Ikea - My parents and I went in together on this for one of the kids birthdays. The mini piano belongs to my mother in law and will go back to her when she asks for it again. 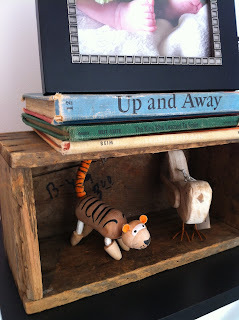 Two shadow boxes from TJMaxx (14.99 ea) - I used some left over anniversary moolah for those. I put a little hat that my mother in law crocheted in one and in the other a baby dedication dress my mom bought that both my girls wore. The table a chairs were a Christmas gift for my older daughter when she was very young (100.00). We didn't know that Ikea existed so we paid more for that set than I would have now. It started out with a white table and multicolored chairs, but I ended up painting the chairs white. Two of the chairs are in this room and the other two will be used in the school room. Two black on white grid patterned duvet covers and matching pillows - (19.99 ea) a Christmas gift from my parents to the kids. "L" pillows for each of the girls beds - (apx 3.00 ea)Made from bargain material from Walmart. The stuffing was from a Walmart pillow. "10" and "07" pillows - (apx 3.00 ea) Made from bargain material from Walmart. The stuffing was from a Walmart pillow. Wire bin - from TJ Maxx - (9.99) Bought with some of my birthday $ I think. I took some photos of the girls and just framed them and put them in a group on the wall. 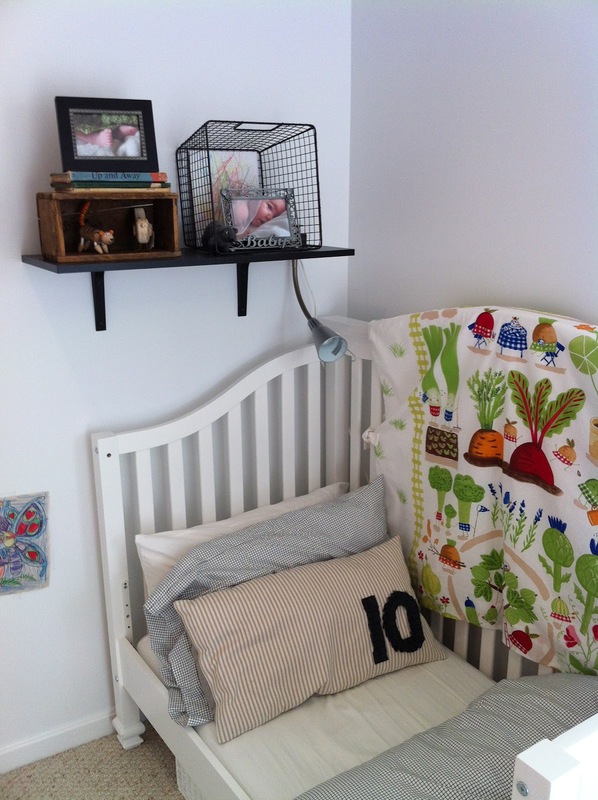 The frames were left over from before we had our first daughter. Not sure on the price. We tend to get our frames from Michaels when they are having a buy one, get one sale. Brown and white striped rug from Ikea (19.99) - Just something my hubby said ok to. White crib turned toddler bed (?) Mother and Father n law bought this for us from Babies R Us when our oldest daughter was born. Added a small black square mirror for my daughter to be able to "fix" her own hair. (?) not sure on the cost but it was in the clearance section at TJMaxx. Pendant lamp from Ikea - (This is one of my favorites. It was originally 69.99, but it was clearanced at 19.99). hubby built me a red rolling storage box to put under Iggy's bed. I wanted one that I found at the Peddlers Mall, but it didn't roll the right way so he said he would build me one. We didn't just up and buy all of these things when I decided to redecorate. Many of the items were things that we just accumulated over time and we just reincorporated them. I seem to have a knack for remembering the cost of the things that I buy even if it was a decade ago. I've learned that there is a HUGE difference in spending from when I was single and working and now that I am married and a mother of two living on one income. I've learned to research, research, research before buying. I've learned to keep the receipt just in case! I've learned that sometimes (actually most times) I have to say no to something that I really, really want. I am glad though that the room turned out the way that it did. I have to give thanks also to the people who have posted photos online of thier own spaces. I can't really name one as it's more of a general style/liking that I've found myself leaning towards after seeing photos of room after room. I hope you liked it and maybe can get a few affordable ideas for your own rooms out of it. Thanks for viewing!